The food that you eat is by far the most important factor when it comes to losing weight. Having a good diet plan is integral and makes all the difference. The first thing to be aware of when trying to lose weight is calories. These are units of energy and all foods have them, but in differing amounts. Foods that have a lot of water, such as fruits and vegetables tend to be low in calories because water contains 0 calories. On the other hand, foods that have a lot of fat tend to be high in calories because fat has 9 calories per gram. This can easily be seen when you compare 100 g of cucumber (95% water) to 100 g of Brazil nuts (67% fat). The former only has 16 calories whereas the latter has 656. You introduce calories into your body when you eat; you burn calories naturally throughout the day and when you exercise. Thus, in its simplest form, weight management comes down to the following equation: calories in – calories out. What this means is that if you want to lose weight, you need to consume fewer calories than you burn. This is known as a caloric deficit. Doing so forces your body to use its fat stores as a source of energy, to make up for the missing energy you would ordinarily obtain from food. It is important to note that even though fat rich foods are high in calories, they should not be feared when trying to lose weight. In fact, eating the right types of fat rich foods can greatly help with weight loss. We will speak more about this later. The number of calories that a person should aim to consume in order to lose weight will depend on various factors including their age, gender, height, weight and activity levels. This means that the calorie requirements for two people can be vastly different. You can use the calculator below to get an estimation of your calorie requirements. For example, a 25 year old lady who weighs 80 kg (176 lb), is 165 cm tall and exercises 4 times a week will need to consume approximately 2400 calories to maintain her weight, 1900 calories to lose weight and 1400 calories to lose weight fast. Once you know your calorie requirements, you can decide what foods to eat and in what portions. This is fairly straightforward to do because there are certain foods (and food groups) that should be a big part of your diet. Vegetables are crucial to a weight loss diet. This is because they are very low in calories, thanks to the fact that most of them are made up of more than 80% water. Despite this, vegetables are nutrient dense foods. Most vegetables, but especially crunchy ones (such as artichokes, parsnips, collard greens and Brussels sprouts) are also high in fiber. A cup of cooked collard greens for example provides you with 21% of your daily fiber requirement. When you eat fiber, it absorbs water and forms bulk in your stomach, thereby filling you up. This in turn can prevent overeating. Indeed, studies such as this have found that by making one simple change and increasing your fiber intake, you can help your weight loss efforts. Vegetables are also packed full of vitamins, minerals & antioxidants such as vitamins A, B, C & K, potassium, magnesium, iron and zinc. All of these are important for a multitude of bodily processes and vegetables can help prevent deficiencies. Vegetables come in lots of different shapes, sizes & colours. Ideally you should aim to eat as many types as you can, including green leafy ones like spinach, kale & Swiss chard, root vegetables like beets, carrots & onions and fruit vegetables like cucumbers, okra and pumpkin. Thanks to their versatility, there are many different ways to eat vegetables. They can be eaten raw in salads, steamed, stir fried, baked and used in hundreds of healthy recipes. Like vegetables, fruits tend to be low in calories, but have the added benefit of being rich in naturally occurring sugars. This makes them ideal to snack on, especially if you are craving something sweet. Some notable mentions are mangoes, bananas, grapes, apples, tangerines and pomegranates. You can also eat dried fruits such as dates, prunes and raisins in small amounts. These are great replacements for candy because they contain large amounts of sugar, but are also rich in fiber. You should aim to eat around 2 servings of fruit per day. There is a wide range to choose from and you can use our healthy food finder tool to discover new options. Fruits can be eaten on their own, added to smoothies or even used to prepare healthy homemade desserts. For example, you can make a healthy version of ice cream using frozen bananas and a few other ingredients. Out of all 3 macro-nutrients (the other two being carbs and fat), protein has the highest satiety. This means that it is the most filling and can therefore satisfy your appetite and reduce overall calorie intake. Numerous studies have investigated the effect that protein has on weight loss and in the majority of cases it has proven to be very beneficial. In this study, increasing protein intake from 15% to 30% of total calories resulted in 441 fewer calories being consumed per day. This is a significant amount. Another study found that a high protein diet reduced obsessive thoughts about food and late night desire to snack in overweight & obese men. Protein also boosts metabolism slightly and helps prevent muscle loss, which is very important when losing weight because you ideally want to burn fat whilst retaining as much muscle as possible. Eating protein at breakfast time has been shown to help regulate appetite hormones and suppress subsequent food intake in studies such as this and this. There are plenty of protein rich foods to choose from whether you are a meat eater, vegetarian or vegan. These include quinoa, beans, lentils, fish, eggs, chicken, nuts, seeds, dairy and some vegetables. You should aim for around 25% – 30% of your total daily calories to come from protein. As mentioned above, even though fat has a lot of calories, it should not be avoided when trying to lose weight. The type of fat rich foods that you eat is important though. Those that are as close to their natural state are the most nutritious and beneficial for weight loss. This includes things like avocados, fatty fish, nuts, seeds, extra virgin olive oil, coconuts, coconut oil and high quality yogurt. These foods tend to be rich in Omega-3’s, monounsaturated and polyunsaturated fats. Foods such as avocados, nuts & seeds are rich in both fat and fiber, which slow the release of food from your stomach. This makes you feel full for longer and could therefore reduce overall food & calorie intake. In this study, participants consumed one of 3 lunch test meals – avocado free, avocado inclusive and avocado added. The avocado added meal increased satisfaction by 23% and decreased the desire to eat by 28% when compared to the avocado free meal. Fatty fish is rich in fat and protein, which makes it an ideal weight loss food. And coconut oil is thermogenic, which means that eating it may increase energy expenditure. It has also been shown to reduce belly fat and waist circumference. This makes it the best type of fat to cook in. Aim for 20% – 30% of your total daily calories to come from good fat. Reducing the amount of carbohydrates that you eat has been shown to be an effective way to lose weight. That being said, carbohydrates are an important source of energy and are vital for the body. However, eating the right types of carbohydrate rich foods is crucial. Like fat, you want to eat carb rich foods that are as close to their natural state as possible (also known as complex or whole carbs). These include vegetables, fruit, sweet potatoes, oats, beans, quinoa, lentils and brown rice. Complex carbs are usually high in fiber and are digested at a steady pace. This helps to prevent dramatic spikes and falls in blood sugar & insulin levels, which in turn prevents overeating and the feeling of ‘crashing’. Whenever possible, try and eat carb rich foods together with protein rich foods. Doing so can help to control blood sugar levels. So for example, you could have a cup of brown rice together with a grilled chicken breast instead of eating the rice on its own. An individual’s carbohydrate intake depends on their age, gender, body type, metabolism and activity levels. Individuals who are more muscular and physically active can afford to consume larger amounts of carbs. As a general guideline, you should eat around 50 – 150 grams of carbs per day. You may need to adjust the amount depending on how it affects your energy levels. If you are diabetic or obese, it is important to speak to your doctor so that he or she can advise you on how many carbs you should be eating. When it comes to losing weight, water is the best thing that you can drink. Because it has 0 calories, you can drink lots of it without worrying about how it will affect your overall calorie intake. Numerous studies have shown that drinking enough water can help with weight loss. This study involved 48 participants between the ages of 55 and 75 who were split into two groups. Both followed a calorie deficit diet but one group also drank 500 ml of water before each meal. After 12 weeks both groups ended up losing weight, but the water drinking group lost an average of 2 kg more. Another study found that adults who drank water before breakfast consumed 13% fewer calories. Additionally, water consumption has been shown to slightly boost metabolism in studies such as this and this. An effective method of reducing appetite is to drink some cold water before each large meal. This has the added benefit of keeping you well hydrated; a lot of people are chronically dehydrated and mistake thirst for hunger. Unsweetened black coffee and green tea may also help with weight loss, thanks to the caffeine that they contain. It is important to drink these in moderation though. Now that you know which foods you should be eating when trying to lose weight, let’s briefly discuss the foods that you should try and avoid. In general, you want to avoid foods that have been highly processed and have lots of added sugar, fat & sodium. This includes but is not limited to cookies, cakes, pastries, potato chips, ice cream, white bread, candy bars, pizza and some frozen meals. Most of these foods are very high in calories but provide little nutrition (making them a source of ’empty’ calories). For example, a piece of chocolate cake has around 350 calories, but comes with very few vitamins and minerals. There is no doubt that these foods are delicious, but eating them does not effectively satisfy one’s hunger and just causes large spikes and dips in blood sugar. This in turn can lead to overeating. 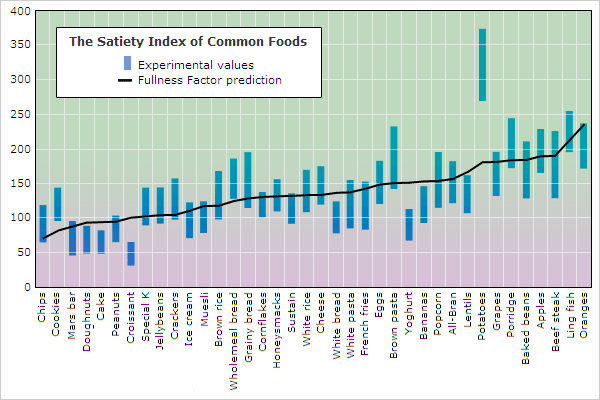 You can clearly see on this graph that these foods have a low fullness factor when compared to other foods. You also want to stay away from sugar sweetened beverages such as cola. These beverages have been strongly linked to obesity. The reason for this is thought to be because your brain does not register liquid calories as effectively as it does those you get from solid food. As a result, you don’t compensate for the calories already consumed. Unfortunately this is also the case with fruit juice, so it is better to eat whole fruit instead. Additionally, alcohol should be consumed in moderation. Drinking small amounts of alcohol is fine, but heavy drinking is definitely not recommended as it is associated with increased weight gain and various health problems. If you are just starting out on a weight loss diet, you might be unaware of how many calories you are consuming per day. In fact if you asked most people how many calories they eat on a daily basis, they are unlikely to know. Luckily, calorie counting is not difficult and there are a number of tools that make it even easier. When counting calories you can either use a pen and paper or a mobile app such as myfitnesspal. For the first approach, you would have to write down everything that you eat on a given day and then refer to a website such as nutritiondata.self.com to get the nutritional information of various foods. For example, a large boiled egg has 77 calories, 5 g of fat, 1 g of carbs and 6 g of protein. You can then tally up all the nutritional data for all the foods to get your overall calorie, protein, carb and fat intake. If you use the mobile app, it will refer to its own database and automatically provide this information for you. This makes it very convenient to use. Once you know how many calories and macros you are consuming, you can tweak your diet plan to make it more weight loss friendly. After a while, you will naturally be able to tell how much of certain foods you should be eating. In order to lose weight, aim to eat a protein rich diet that contains lots of vegetables & fiber and some healthy fat & complex carbs. Before making drastic dietary changes, it is important to speak to your doctor, especially if you suffer from any medical conditions.